In a timely essay Guled Ahmed Jama, the Director of the Human Rights Center in Hargeysa, wondered if politics based on loyalty to the clan “ is inevitable” in Somaliland? “It is evident that clan politics is undermining the stability of Somaliland and challenging good governance and citizenry. Clan-based politics harbour nepotism, favouritism and corruption” Guled wrote. While I agree to his diagnosis of problems ailing Somaliland political life, I disagree with him on his view that Somaliland political parties enhance the practice of clannism. The problem is a lack of a common definition of clannism I defined clannism as “an illegal and amoral process to use political power to help close or distant relatives to gain an unwarranted economic benefit, evade justice or marginalise a segment of the citizenry.” The person who wields political power uses clannism for a political end. Clannism – qabyaalad in Somali— is not always about genealogy (abtirsiinyo). A ruling party can practise clannism because it has a mandate and an access to make decisions about public resources. In the case of Somaliland, there is no a fear that the government will confiscate a private property but people close to the government can exploit their connections to acquire a public property illegally. Clannism facilitates and promotes theft of public properties and assets. Clannism is not a tradition-bound practice but a modern phenomenon continually undermining cohesion and citizens’ political identity based on the nation state. Shared clan identity is not a precondition for benefiting from clannism. Clannism is transactional by its nature. Only when a service (e.g. canvassing support for a politician) is rendered does a politician use his/her influence to return the favour. In a clannism-ridden political environment monopolies and rent-seeking business elites dominate the economy. The executive and legislative branches become a tool for businesses seeking an unfair advantage in the market. Institutions built on the separation of powers and independent judiciary are antidote to clannism. Last year when President Muuse Bihi returned to Hargeysa from a visit to Eastern regions, he gave a speech in which he urged people to abandon loyalty to the clan identity. “People had better associate with each other occupationally ” President Bihi said. President Bihi follows a tradition to blame citizens for practising clannism. After the 1969 coup military leaders of Somalia ( 1969-1991) delivered speeches to disabuse people of banking on clan identities, which the Junta likened to clannism. It was a cynical plot to divert people’s attention from politicians – practitioners of clannism. According to Guled, Somaliland political parties appealed to clan sentiments during 2017 electoral campaigns. There was no outright, clan-based election campaigns endorsed by political parties. There is a perception that clan-based rivalry was at play before elections. This perception is based on the desire to look at the Chairmen of Waddani and Kulmiye through clan identity lens. Waddani garnered the highest number of votes from constituencies that are not associated with the Chairman of party, Abdirahman Irro, by clan. This an evidence that Somaliland politics can be reset if the ruling party commits itself to anti-corruption measures ranging from an independent audit of public properties and land to cracking down on cronyism. 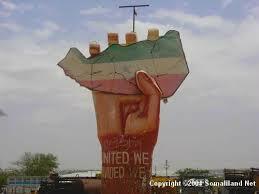 Clannism gradually weakens Somaliland’s hard-won achievements. The ruling party controls both the House of Representatives and the House of Elders. The dissolution of UDUB party had made Kulmiye the party whose MPs control the House of Representatives. Somalilanders have not addressed this democratic deficit to date. Guled deplores a lack of ideas in political programmes of Somaliland parties. Waddani has long campaigned on decentralisation and genuine power-sharing through constitutional reform. In Somaliland ideas about good governance do not get traction. In Eastern Somaliland, particularly Disputed Territories where people expect to benefit from an agreement the former Somaliland government signed with Khatumo Movement, Somaliland government chose to prove its critics right: it is an administration dependent on local clan militias. Political leaders from those areas – Yasin M. Hiir, Somaliland Foreign Minister, and Saleban Ali Kore, the Minister for Water Development – support the ruling party’s policies to keep those regions in perpetual conflict and under-development. They belong to the area and claim exclusive representation privileges although Mr Hiir would have lost the constituency seat had parliamentary and presidential elections been conducted simultaneously. Clannism can be a weapon used by politicians against their purported constituencies. Traditional leaders who met at Ga’an Libaah have called for the Somaliland government to address, among other issues, complaints of people in the Disputed Territories. Policies of a ruling party can cause the demise of a nascent democracy. Somalis learned this lesson half a century ago. Somaliland seems to be on the path to relearning that lesson.